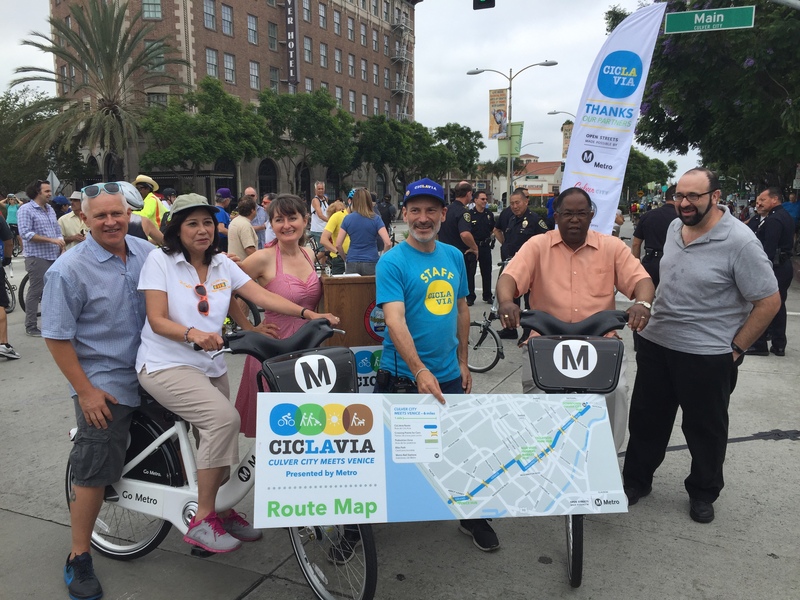 Thank you to everyone for coming out for CicLAvia today between Culver City and Venice. 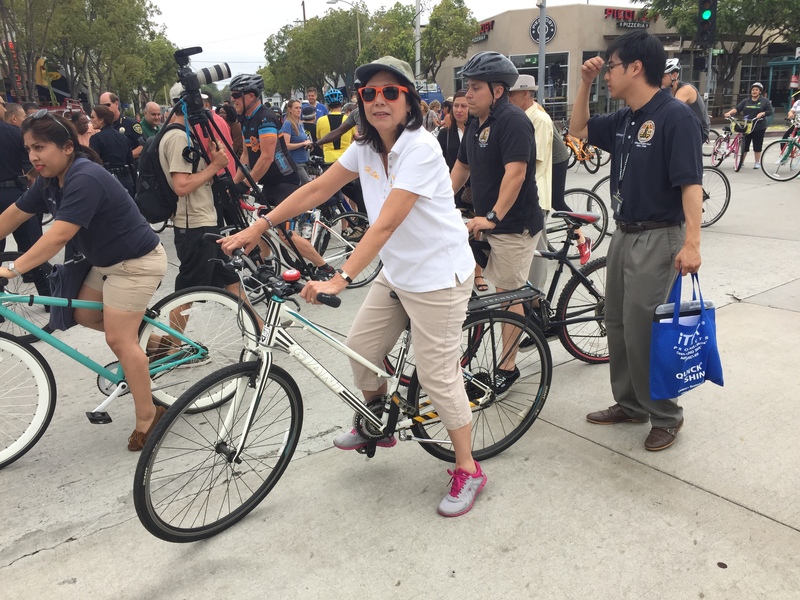 It was — as expected — another huge crowd that got to enjoy car-free fun on Washington Place, Venice Boulevard, Grand Boulevard and Windward Avenue all the way to the beach. Metro helps fund CicLAvia through its open streets program, which promotes walking, biking, skating, skateboarding — anything human-powered — and transit. From where we sit, the CicLAvia events have been a great opportunity to give people a chance to ride our emerging rail system and remind everyone that a good way to avoid traffic is to — at least occasionally — get around by foot, bike, etc. 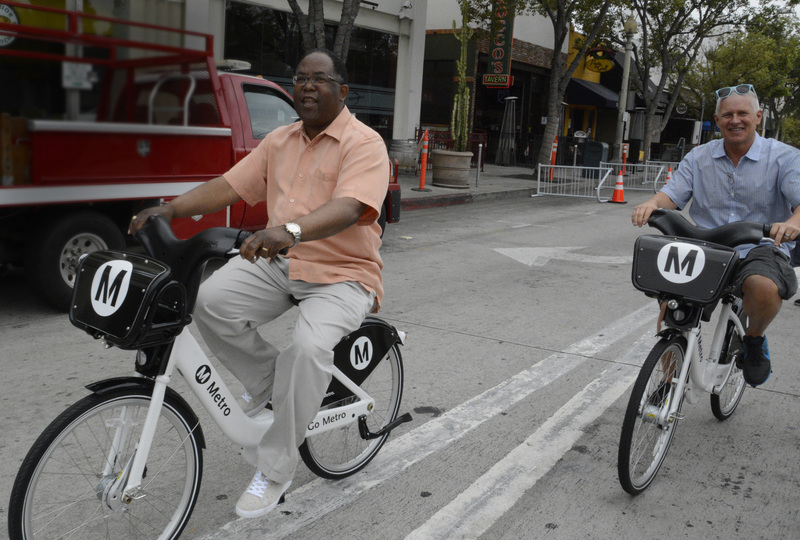 Metro Board Chair Mark Ridley-Thomas and Mike Bonin on the bikeshare bikes. Photo by Jennifer Gill/Metro. Metro Board Member Hilda Solis. Great pics! That was my first CicLAvia and I had a great time. Do you have any attendance estimate? The police estimate (20,000) is a reasonable estimate of the number of bikes on the road at the peak of the event, but you have to account for the fact that most people only rode their bikes for an hour or two. My guesstimate (FWIW) for the total attendance is between 70,000 and 80,000. I haven’t looked too hard for estimates, but your guesstimate strikes me as reasonable. I think it’s fair to say that there were many, many thousands of people out for the event — for all the CicLAvias this year, thus far. Metro is the big funder of these events and I’m pleased to see the money going to good use. I really think these events are good for fostering community and promoting other ways to get around. Plus, they’re a great way to give something back to the taxpayers. Seeing people carrying their bicycles down a flight of stairs in one of the photos above, at what I assume is a Expo Line station, points out how far behind Metro is in designing rail stations to accommodate bicycles. How many people would be willing or strong enough to go through that struggle on a daily basis? In the Netherlands, bicycles never have to be carried up and down stairs at rail stations. There are gutters on the side of stairs that enable you to roll your bicycle next to you as you walk up or down the stairs. There is a limit to how many bicycles can be carried in a train or on a bus. 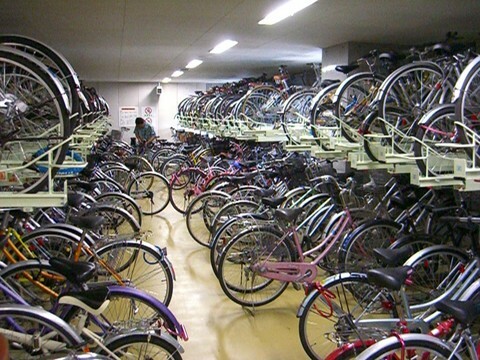 To keep the share of transportation trips done by using bicycles increasing there needs to be adequate amounts of bicycle parking at bus stops and rail stations. A lot of people certainly carried bikes down stairs at Culver City station yesterday. The photo, however, does not show the large elevators at either end of the platform. Some people used the elevators and others chose not to wait and took the stairs. I visited that station and noticed the same thing. Half the bikes were carried down the stairs, and the other half waited for the elevator. The lack of “gutters” or “cycle ramps” at Metro stations, is one of my pet peeves. The only place in LA that I’ve ever seen one of these gutters in use is in the pedestrian underpass under PCH near Will Rogers State Beach. My other peeve is the lack of bike parking spaces. I’ve been trying to get a bike locker for one of the Expo Line stations since the beginning of the year. They (Metro) wouldn’t even take my name until June, and I’m still a long way down the waiting list. How much does a bike locker cost, as compared to a car parking space (which is over $30,000 for a space in a parking structure)? Wouldn’t it be a better use of Metro funds to build and install bike lockers than parking structures? The new El Monte Station has bike gutters! They are pretty cool. Frequent Flyer: I don’t care what the box looks like, I just want a secure facility to store my bike. And yes, I realize that the Culver City Expo Station is supposed to get a Bike Station (just like in your picture) next year, but I’m old, impatient and I don’t want to wait. I agree. They can just bring in one of those modular classrooms we have in our public schools and just dump them onto the parking lot so that we can use that as bike storage spaces. They can do this now as a temporary solution until they get the permanent bike storage facilities built. Helmets aren’t required by law. That said, I recommend wearing them. I do think CicLAvia is a bit different in that it’s not a terribly high-speed ride for most participants. That being said, the comments left on the LA Streetsblog article back in February when the bill was introduced shows how much everyone feels that we live in a nanny state we live and everyone is getting tired of this “because it’s the name of public safety” stuff.